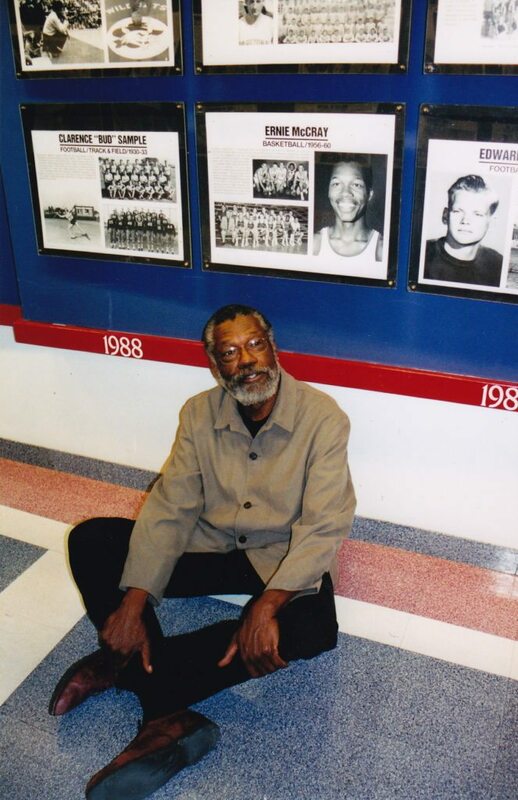 Ernie McCray sitting below his college-era photo and awards. "All-Century" Dude. Well, I intended to be there but I lost my wife a few months ago and I find that my energy ebbs and flows; I was excited about driving to Tucson with one of my twin daughters and now she can’t make the trip and my enthusiasm has waned. But, wow, has it really been fifty years since we were tearing it up back in old Bear Down Gym (well, in our case, maybe” tearing it up” isn’t the right phrase). I do, however, remember it being fun, playing a game you love at the school’s expense, and, at the same time, copping a degree – I’ve got to say that worked for me. And to share that experience with you guys was icing on the cake. Yes siree. I remember how we went into the 59-60 season with one thought in mind: to not have another season like the one before when our number of wins was: four. Was that not a scene from a horror show? Also when we started playing that year I had no idea that by the season’s end my name would be mentioned with the likes of Roger and Leo Johnson and Linc Richmond, my childhood hoops heroes. That still seems surreal to me. Then the next thing I knew I was in possession of 12 scoring records when before all that I don’t think I had much of a concept of sports records other than Babe Ruth having hit 60 homeruns and Jesse Owens having gotten off the world’s greatest long jump which we used to call the broad jump. And Adolph Hitler probably held the record for wincing and choking as Jesse, in the 36 Olympics, showed his rear end to the Aryan master race – in their face, at their place. So the records were a pleasant surprise to me, kind of healing for the stuff going down in society back in the 50’s and 60’s. And I’m glad it was you guys who experienced all that with me although I know I owe you an apology for every time you heard Fred scream: “Goddamit, get the ball to Ernie!” I’m sorry. And did you ever. I mean Warner would maul somebody underneath our basket and grab a rebound and pretty soon he’s dished me a pass and I’m going: “Look what I found!” Another two going down! And Marv’s passes were always right on the button so you don’t have to break stride, able to pull up for a jumper, or just glide to the hoop. Jon. Mr. Consistency with a capital C. Always knew how to get the ball to me. Bill Weese and Kirk would give me those great passes from up in the air, passes that started out as jump shots (and those dudes could shoot) but ended up with me because that was the way it was designed to be. Again, I’m sorry. And one night we hit the courts against L.A. State and everybody was playing exceptionally great and I got ignited and entered a zone where, when it came to shooting, I could do no wrong, and when we were done with all of our tricks I had hit for 46. And on this coming February 6th, if one of those young Wildcats hasn’t caught on fire and become transfixed like I was, that record will be a half century old. For me that was a night that glittered like gold, forever etched in my soul. It took each fraction of our efforts to make that a whole. Sometimes I find it hard to believe all that I’ve received from our time in Arizona basketball history. Since those days my picture now hangs in our Hall of Fame and Player of the 50’s on the All-Century Team is typed above my name – for just suiting up and playing a game. I would do it all again and I would want to do it with exactly the same people with whom I did it before. And you’d love it because over the years I’ve learned how to pass (smile). your recollections bring back memories of my own…not on the court but on sidelines jumping up and down with pom poms in hand to cheer on Brawley High Wildcats. Do all old gyms smell the same? Do old gyms smell if no one is there? Oh, I wish you hadn’t reminded me of the “gym smells.” Whoo, some really smelly ones, I’ve smelled a few. But to me there’s nothing like gym sounds: the swishing of the nets and the pom poms, the jumping up and down with a “Billy! Billy! He’s our man! If he can’t do it, nobody can!” the squeaking of your shoes when you make a nice move, the “oooo’s” of a great play, the “boos” for not so good play or dirty play, the “switching” on defense, the conga sound of the ball bouncing on the floor, the world outside a far distance away – meditation on the run. Well, I’ve gotta run. I’m glad I surfaced some memories for you. I’m watching your “Cats” play my alma mater, Washington State. It’s tied at the half. 35-35. Great game! I’m just hoping that none of the Az. players get into a zone as you did. Go Cougs! Wowwww! 78-76 That was close. Could have gone either way. I didn’t see the game but it seems like it was a whopper! Lot of inexperience on the Wildcats. I haven’t been paying much attention yet regarding the Pac-10 so how have the cougars been doing? The Cougs are playing surprisingly well. We have a new coach this year, Ken Bone came from Portland State. He is picking up where Tony Bennett left off. Bennett took the head coaching slot at U of Va. We went to the NCAA tournament the past two years (made it to the Sweet 16 last year). We have a sophomore, Klay Thompson that is amazing. Currently third nationally for scoring. His dad played in the NBA for 12 years and mom played volleyball at USF. Good genes! I hope he sticks around for another year or two! Ernie, stay in touch, the Cats and the Cougs play Feb 6 in Pullman. I’ll keep an eye on the schedule and see if it will be on TV. If so I’ll let you know. The loser can buy the winner a cold one! Hey, Steve: Now, that’s an offer I can’t refuse. Have a good one. Such a great piece. I was at the UA-BYU basketball game at McKale a few weeks ago and some BYU guy went off for 49. I thought of you and was happy to know your UA record still stands – and is likely to for quite a while. I miss the pieces that you and Billie Stanton used to put together for the Tucson Citizen. Very sad when the Citizen closed after I had worked there close to 35 years. Thanks for the memories. What a pleasant surprise to read a comment from you on this website. I still haven’t completely recovered from the Tucson Citizen having faded away like some old soldier. I thoroughly enjoyed being able to keep in touch with my hometown through my words in the paper. Thank you for the memories and I hope you’ve moved on to something worthwhile. I’ve been in touch with Billie a couple of times and I hope all goes well for her in Montrose. Take care.